Digital Transformation is one of the most current issues for company managers. People are talking about it on the web and at conventions. Not all brands are adopting this new process, which is having an explosive effect on the business organization and traditional strategies. Nevertheless, companies are increasingly aware that the digitalisation of processes can increase competitiveness and stimulate business growth. Managers are now convinced that Digital Transformation is a crucial process for any brand that intends to meet market challenges. In the years to come, being competitive means radically transforming businesses, their products or services, and introducing digital innovation to support the process. It is commonly believed that Digital Transformation essentially consists of digitalising organizational, production, distribution, and marketing-related processes. This is inaccurate, true digital transformation can’t be achieved just by adopting a new platform and transferring data from company servers to a cloud. Investing in IT is part of the process, but is only the most disruptive and radical side of the coin. Digital Transformation necessarily includes substantial innovation of business strategies, product creation, internal organization, and marketing. A transformation must be made in each of these spheres that entrusts the operational portion to digital but is supported by a new vision of the market and the actions to be taken within the business. Digital Transformation, first of all, requires top managers to change their mentality. Their job is to guide the phases of the process within the business. Managers need to change their mindset and consequently revise business strategies. It’s indispensable to have a new cultural approach that changes how they think and acts on the company’s organizational assets and business strategies. Digital transformation is a revolutionary process for businesses. It’s not about innovating already structured processes, but rather substantially changing business culture. The core of the process is the transition from a product-based vision focused on making the product more effective, to a customer-centered vision, which requires a new approach. Customers, their needs and their decisions, are the compass that guides digital transformation. It’s not about simply creating better products and services, but about listening to customers and understanding their requirements, then creating products that more closely meet their needs. Knowledge of customers, their specificities and their needs makes it necessary to adopt techniques and instruments to learn who they are, what products or services they demand, and what are their specific needs. Digital Transformation has an explosive effect on designing a business’s products and services. The product is the response to the customer’s needs, while its development is based on market demand. Digital transformation also makes it possible to create in less time, to translate the same product into different versions in order to meet the needs of different targets. Managers who deal with products must adopt data-driven development strategies because data is the lifeblood of product engineering and development based on models. All ideas, all digital models of products, all simulations now depend on the reliability, completeness and timely collection of supporting data. Digital Transformation is a process that involves all collaborators in the various sectors because it changes the business’s vision and processes. The digitalisation of processes is a change in itself, but a transformation that revolutionizes traditional structures necessarily involves the entire workforce, from logistics to production, marketing to management. For example, HR managers must develop new training programs for all employees, who must handle new work methods and interface with online platforms and new digital tools. It will be necessary to identify new employee competencies – which they may already possess but have never utilized – and train all staff in the new business strategy. In many cases, the organization chart will include new functions tied to the digitalization process, and it will be necessary to identify, for each business sector, what digital competencies are most lacking and need the addition of new professional figures. A customer-centered vision also involves re-planning the various methods and channels of customer care, a fundamental element of contacting and understanding users. Digital transformation also affects commercial aspects and product promotion. A customer-centered approach requires a new way to reach customers, both current and potential. It is thus necessary to carefully collect and manage contacts through lead management activities and to use a well-developed CRM platform that permits lead generation actions and manages marketing automation of various functions related to the customer’s journey. With digital transformation, it will be more necessary than ever to understand your customers, profile them, and create homogenous targets in order to present personalized offers based on various customer types or tailored to individual behaviour, as revealed by various touchpoints or purchasing history. Even product-based traditional marketing that’s directed to the public at large must be revolutionized by Digital Transformation. Digital marketing is necessarily tied to data. All actions and their results are in fact measurable, and thus can be perfected and tailored to the customer. For some well-known companies, case studies confirm that digital transformation began right in the marketing department. The digital approach and the need to know how to collect and analyze data from online campaigns or sales in brick and mortar stores, make it possible for marketers to also transfer competencies to the professional figures with whom they collaborate, and to motivate managers based on results. Does digital transformation do what it promises? Many companies have initiated the process of Digital Transformation and have succeeded in revolutionizing their organizational structure, products, and marketing strategies. Here is one of these case studies, which summarizes the path the company took and its results. Here is an Italian example of Digital Transformation. Accredia is the government-designated body that verifies and attests to the competence, impartiality, and neutrality of certification bodies and laboratories that verify that goods and services comply with technical regulations. Accredia essentially checks to ensure that certifying bodies and product analysis laboratories operate in accordance with the pertinent technical regulations. The digital transformation project was entrusted to an outside agency through a call for tenders. The process involved and engaged all parties within the organization for 12 months. The call for tenders involved a complete update of the public portal and restricted areas, accessible to employees and members. The process began with a determination of the operational and communication needs of parties operating within the structure, identified as Accredia stakeholders. The basic objective was to improve brand reputation and trust in the body through a web portal focused on user experience which provided the foundation for a platform that would offer tools for site visitors and the body’s staff. The digital transformation process was set up in various phases. By adopting open source technologies, which made the project sustainable and not bound to specific suppliers, a platform was created to publish and update accreditation documents and the database of certified parties, to facilitate the search for contents. A benchmark for the websites of accreditation bodies in other nations was thus created to obtain a complete picture of good practices related to UX and navigability. Site traffic was then analyzed, which provided information on the user’s customer journey. Finally, an SEO audit was performed of the old site, which annually registers a million sessions. Then the most important keywords for positioning purposes and the contents most popular with users were highlighted, in order to guide content curation. An analysis of research intentions provided additional details on the information architecture of the new portal. Digital transformation necessarily involves the people who work in the company. In this case, it was decided to hold various workshops, through co-design methodologies. After selecting 15 participants per workshop, actions were taken to highlight the user’s needs and the problems that impede the customer journey. The groups were also consulted to identify the best value proposition and its communicative slant. People who work in the contact centre were then brought into the discussion. They reported that they had been asked questions that were unrelated to the body’s activity, and it emerged that its identity needed to be explained in an easily understandable language in order to reduce customer care work. User archetypes were then created to plan how to address clearly defined segments of the public and respond to specific needs, planning the site appropriately. In terms of internal communication, the new platform reduced and streamlined time frames for periodic meetings by adopting technologies to serve the process. Within the body, there is a growing awareness of the value of the quality and effectiveness of what is published, with more user-focused reasoning, at all levels of activity. In terms of efficiency, work groups now operate more quickly, aided by a well-designed platform. The site reports increased traffic, and data analysis shows that users find the desired information more quickly. Internal autonomous management of the site has improved, along with the ability to generate quality content. Digital transformation involves changing the way managers and all employees think, but is achieved through digital tools that streamline processes and exchanges of information. This is a tool that makes it possible to identify the business’s characteristics in terms of the type of customers, value proposition, channels for reaching users, actions to take, and the costs and revenues structure. A visual analysis of the business situation and future prospects makes it possible to plan new processes using a clear photograph of the business and its potential. The tool makes it possible to define stereotypes and User Personas within the business, and then assess staff competencies. Employee Centered Design facilitates selection of training programs, the creation of workgroups, and setting objectives for teams and individuals. The platform makes it possible to prepare a list of employees with their age, role, competencies, level of training, motivations and objectives. Also indicated are hard skills, cross-over competencies and the percentage value of the person in relation to their team. The tool is useful for highlighting individual training needs and assigning goals to individuals and the workgroup. The goal of the tool is to analyze the culture of a business and transform it based on set objectives. A culture map creates a map that shows people’s most frequent behaviours in terms of communication flows, processes and habits within the organization, and factors that promote or slow down the change in business culture. The tool includes Digital Transformation Radar, a diagnosis of the business that indicates the level of digitalization and identifies elements significant for digital transformation in terms of People, Processes, and Technologies. The tool essentially identifies the elements that constitute the value of the business and shows elements supporting strategic decisions. The Digital Transformation process is based on certain basic elements, but it primarily consists of a change in mentality, which takes the form of projects and operating processes. Books on the subject promote a new way of thinking, which provides a guide for analyzing the current situation and making strategic decisions. 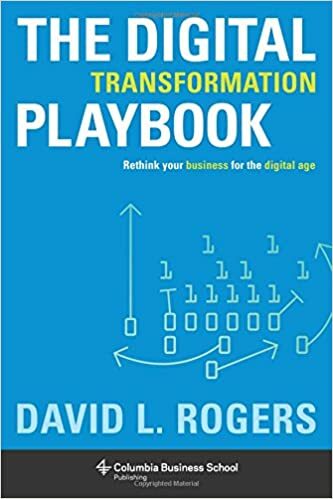 In the book, the author, who is quite well known in the digital world, shows that Digital Transformation is not about simply adopting technology, but requires a substantial change in mentality. The book reveals how to make use of customer networks, platforms, big data, rapid experimentation and groundbreaking business models, to integrate them into businesses. The book presents case studies of large companies, including Google, GE, Airbnb and the New York Times, and offers planning exercises and tools. The authors, all McKinsey analysts, reflect on the changes that companies and businesses are experiencing. The book highlights the action of the four forces that impact and influence the global economy: the rise of emerging markets, increased impact of technology on market competition, the ageing of the world’s population, and increasing global flows of trade, finance, and people. The book is quite interesting due to the excellent arguments presented and offers an overall view of the themes that underlie Digital Transformation. The Digitalist is an excellent reference for professionals and managers who deal with digital transformation. Its contents are updated multiple times daily and written by highly qualified authors. The site is one of the most popular in the sector. The site offers articles on technology, data analysis and digital marketing. The subject of digital transformation is discussed often and authoritatively. CIO articles are written by experts in innovation, technology and leadership, as well as by the Chief Innovation Officers of well-known companies, who explain how the processes of digital transformation developed in their companies. Magazine and website with a long history that for decades has been known for its list of the richest people in the world. In the digital world, the site is universally recognized as authoritative due to its continuous updates and quality content. Digital transformation is one of the most common subjects discussed, with valuable articles, case studies, and research. Digital Transformation is now unavoidable for companies and organizations. Failure to participate in digitalization and customer-centered innovation means failure to value a decision that has direct effects on competition in markets and the web. whose strategies are guided by data.